Hanukkah commemorates the story of the Maccabees, a small Judean army that recaptured the Temple in Jerusalem from the ancient Greeks. According to the story, the Maccabees were able to find only enough oil to light the Temple’s menorah for one night, but the oil miraculously lasted for eight days. In honor of that “miracle of oil,” Jewish communities celebrate Hanukkah by eating all manner of fried foods. Potato latkes and jelly doughnuts called sufganiyot are the most widely known of these dishes in America. But in Italy, the focus is decidedly on pollo fritto— crunchy, oil-kissed fried chicken. This version of pollo fritto quick-marinates the chicken pieces with a mix of lemon, garlic, cinnamon, and thyme for an added dimension of flavor. 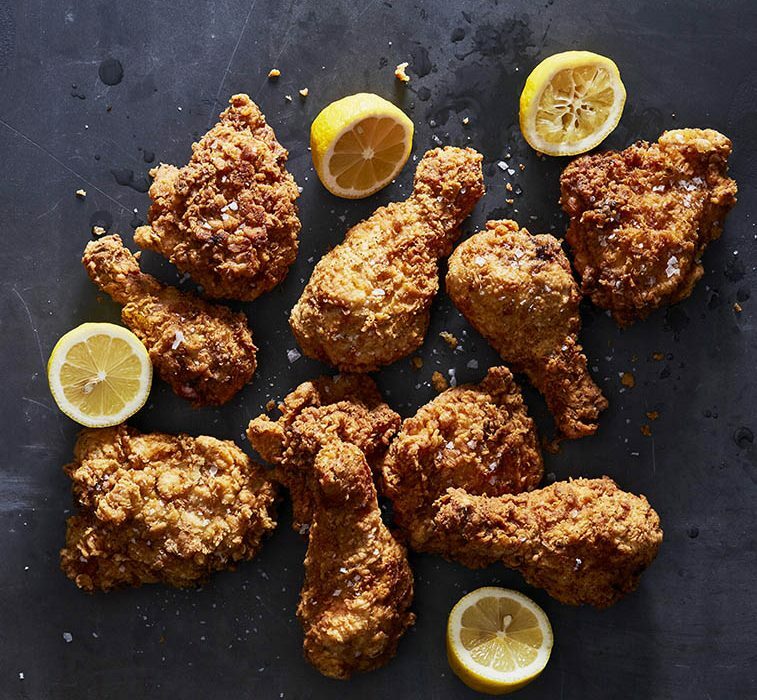 Serve the fried chicken with extra lemon wedges for squeezing or with your favorite dipping sauce. 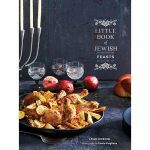 Reprinted from Little Book of Jewish Feasts by Leah Koenig with permission by Chronicle Books, 2018. Photo by Linda Pugliese. Combine the chicken, lemon zest and juice, garlic, 1 tsp salt, pepper, cinnamon, and thyme in a large bowl with a tight-fitting lid. Cover the bowl and shake to coat the chicken. Refrigerate for at least 1 and up to 2 hours (not longer, or the meat will be tough once cooked). 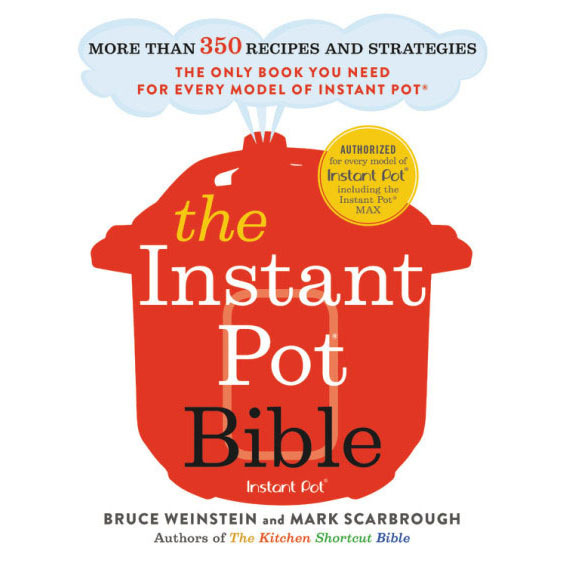 Fill a Dutch oven or large deep cast-iron pan with 1-1/2 in [4 cm] of oil and set over medium heat until the oil reaches 375°F [190°C] on an instant-read thermometer. Meanwhile, line a large plate with several layers of paper towels and set aside. Stir together the flour, onion powder, and garlic powder in a wide shallow bowl. Beat the eggs in another bowl. Remove the chicken pieces from the marinade and brush off any garlic or lemon zest. Dredge the chicken pieces in the flour mixture on both sides, shaking off the excess. Dip in the egg to coat, allowing the excess to drip off, then dip once more in the flour. 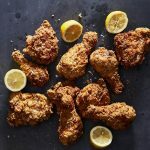 Working in batches, if necessary, add the coated chicken pieces to the hot oil and fry, turning occasionally, until the chicken is golden brown and cooked through, 15 to 20 minutes per batch. An instant-read thermometer stuck into the deepest part of a thigh should read 165°F [75°C]. If frying in batches, add additional oil to the pan as necessary. Transfer the fried chicken to the prepared plate to drain and sprinkle with a little more salt. Serve immediately. Store leftovers, covered, in the fridge for up to 3 days.